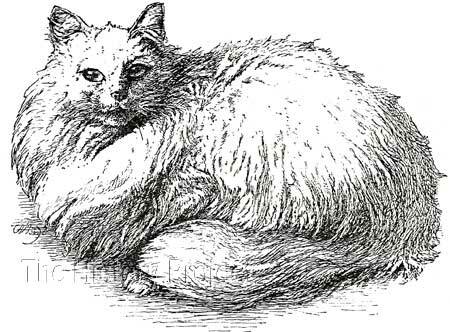 From a drawing by Harrison Weir, Our Cats and All About Them (1889)2. Courtesy of The Harrison Weir Collection. The appearance of 'Miss Whitey' on the show bench was most timely. Born in 1884, she appeared in full maturity during the 1888 show season, just as Harrison Weir was gathering material, writing for and illustrating the text of his epic work Our Cats, which was subsequently published by R. Clements & Company in 1889. 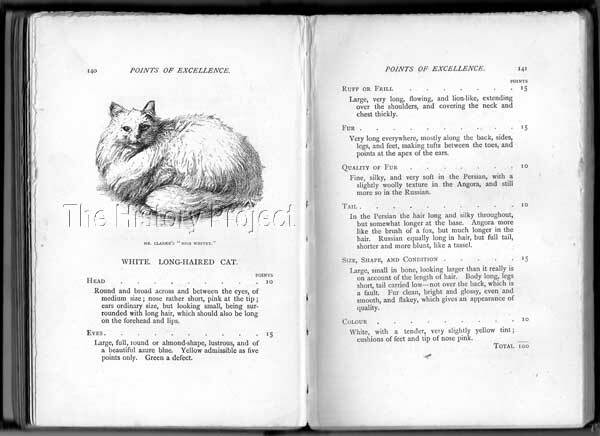 It is therefore also duly appropriate, that Harrison Weir saw fit to take the trouble to draw an image of 'Miss Whitey' and to use it to utilize it to illustrate his 'Points of Excellence' for the 'White Longhaired Cat' on Page 140/141 of this classic work, an image of which is shown in both the 'Illustrations' and 'Social Media' sections. Forty or fifty years ago they used to all be called French cats, as they were mostly imported from Paris - more particularly the white, which were then the fashion. 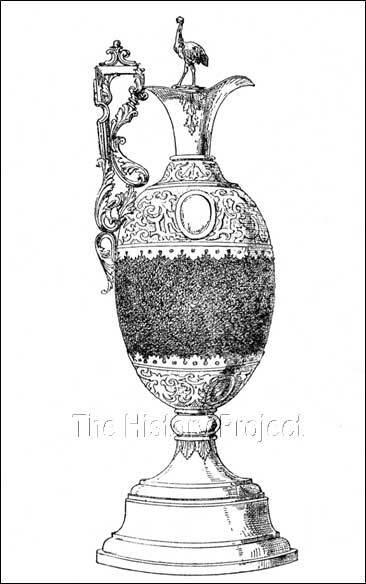 From this we clearly see that this suggests the development of the White Persian, among other varieties, having its roots in a mixed ancestry and that this may have had its beginnings in France. It is also important to remember that the Blue Persian, in some instances, came out of matings between Black Longhaired cats (carrying dilute) and White Longhaired cats that masked and/or carried dilute. Mr. & Mrs. A. 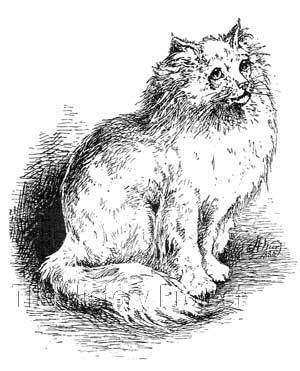 A. Clarke, who were based at the Langham Hotel, in Hastings, can be counted among the very first of the major breeders of Long-haired White cats during the 1880's and 1890's. Many other breeders had their foundation, or their own lines supplemented with cats coming from out of the Clarke's bloodstock; including such breeders as the Hon. Mrs. McLaren Morrison, Mrs. Louisa Herring, and Mrs. Cockburn Dickinson. Although the Clarke's bred long-hairs in a wide variety of colours, their first claim to fame was definitely as the breeders of top quality whites. Although there is no definitive proof of any siblings to 'Miss Whitey', it seems remotely possible that the well-known male, 'Timothy' (NCC: 1184), could have been a sire-sibling, having been born in December 1884, bred out of a female named 'Tibbs'. 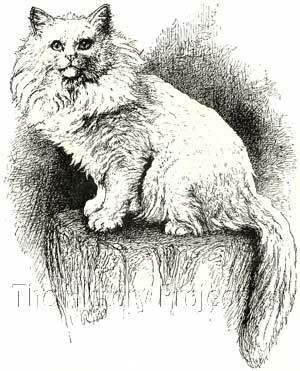 'Timothy' has no sire listed, but is similarly featured as an example of the White Persian in Harrison Weir's classic work Our Cats (1889). No progeny of 'Miss Whitey' are recorded. Two contemporary White Longhairs of 'Miss Whitey'. Illustration of Mrs. A. A. Clarke's 'Miss Whitey' by Harrison Weir. 'Miss Whitey', & 'Tim', owned by Mr. & Mrs. A. A. Clarke, represent the growing interest in Long-haired cats as show specimens during the 1880's, during which the solid colours of White and Black had considerable influence and success. Mr. Clarke, acted as both the Treasurer of the National Cat Club from its inception, but also when the time came, as the National Recorder and Compiler of the Stud Books & Register. Although the Whites remained popular, the rise of the Blue Persian was just around the corner, and in the 1890's the Blues rose to new heights, challenging the supremacy of the White. The Chinchilla was also gaining in popularity, so that by the turn of the century, it was anyone's guess as to which of these three favourite Long-haired varieties would conquer at shows. By winning the National Cat Club's Challenge Cup, 'Miss Whitey' had set the bar high, early on, and now it was up to other Longhairs to attempt to follow.